Tired of playing games with the same old boring chips that everyone else has? These Coin Inlay clay composite poker chips will set your game apart. These heavy 15 gram poker chips feature a metal inlay with the denomination in the center. The metal inlay poker chip style is still popular in many Las Vegas casinos today. Not only will the look of these chips make your home casino the best in town, but the feel will be what everyone talks about. The soft feel and great shuffle of these chips invites people to play, and instantly turns your home gameroom into a high class Las Vegas style casino. 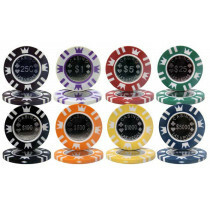 Give your home casino a truly unique set of high quality metal inlay poker chips today!